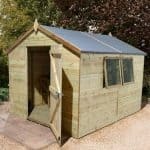 The Waltons Tongue and Groove Wooden Multi-Store Garden Shed is one of the most interesting sheds that we have had the pleasure to look at in quite some time. This shed really does give you two in one. You get a standard storage shed that with its raised eaves offers you plenty of general storage space, but then there is an extra storage shed right on the side! This, with its large and lockable doors, gives you a safe place to keep your bikes or anything else you want securely locking away. The whole shed has a really smart modern style and we are positive that people are going to love being able to separate their items in between the two sheds. 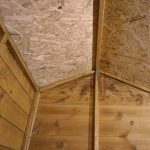 The roof and the floor are made with 8 mm thick solid sheet boarding, which we know is not the thickest, but the walls and the frame really do make this one very robust shed. 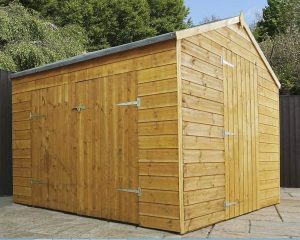 The walls are a combination of 12 mm thick tongue and groove cladding and a strong 25 mm x 25 mm frame that really do come together to make the shed strong and long lasting. Double z framing on the doors and a shatter proof styrene window are just a couple of the other highlights that this shed has going for it. Is two sheds in one! It takes a lot to blow us here at WhatShed away, but the Waltons Tongue and Groove Wooden Multi-Store Garden Shed certainly did just that. We have seen multi storage sheds before, but not one done in a style like this. This shed is like you are getting two in one. You have a main storage shed which is pretty standard, but as well as this you have an extra section on the side. This extra section is great as it can be used to store things like bikes, garden toys and other items you do not want mixed in with tools and gardening equipment. It is such a great idea and something we are sure many families will find very handy. Your kids will not need to mess with tools when they are putting their bike away and they will actually have no excuse for not putting it away. The internal size of the shed is 7 feet 7 inches in the depth and 5 feet 2 inches in depth. This is still a pretty decent size for plenty of tools and other such items. The side portion of the shed is obviously still 7 feet 7 inches in the depth department, but the width is 2 feet 2 inches, more than enough room for a couple of bikes. One very impressive aspect of this shed is the height. We are actually surprised Waltons are not making a bigger deal of this. You see this shed has an eaves height of 5 feet 11 inches and that is a good 4 to 5 inches higher than what most other 8 X 8 sheds have. The ridge height is 6 feet 11 inches, so you will have a very generous amount of headroom inside of here. Waltons have gone for an apex roof and that is fine with us. The roof is made with 8 mm thick solid sheet boarding which is what most budget priced sheds use. To be fair, we do not actually have a huge issue with this as we have seen many other sheds with a roof like this. Covering these boards is some standard roofing felt which will keep the rain and snow at bay. Now, our only little gripe with the roof is that it will cause the rain to run off where the side shed is located, but in all honesty we really do not know what Waltons could have done to stop this. However, we felt you should know that if you are putting your bike away in the rain, then you can expect the water to be running right onto your head. While the Waltons Tongue and Groove Wooden Multi-Store Garden Shed may be saving a few pounds with its roof and floor, it has gone all out for the cladding. They have used this very smooth looking tongue and groove shiplap cladding. This cladding is an impressive 12 mm thick and it interlocks so tightly that there is no way you will have any rain getting inside of here. Inside the shed is a pretty impressive frame. It is a 25 mm x 25 mm frame and that is fine with us. This frame is going to be more than strong enough to ensure the shed stays strong and solid for many years. Even if the kids just toss their bikes in here, we do not see the shed suffering from it. The same 8 mm thick solid sheet boarding that makes up the roof also makes up the floor. We do wish that they went a little thicker, even 10 mm thick. But it is what it is and for an extra £12.95 you can add an extra strength floor pack which we would actually advise you do if you plan on putting a few heavier items in this shed. The shed does have a basic basecoat treatment which will look after the shed during transporting and while you are installing it. However, it will require a coating of wood treatment shortly after installation. We always feel that it is best to just roll your sleeves up and do it as soon has you have installed the shed. A fresh coating will need to be applied on an annual basis to really make sure the rot stays away. 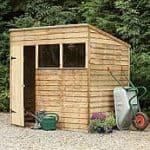 We know this sounds like a lot of work, but this is pretty standard for most sheds in this price range. Waltons give you a ten year anti rot guarantee, but this guarantee is only valid once the shed has been given a coating of wood treatment. So like we said, please do not leave it too late to treat the shed! The Waltons Tongue and Groove Wooden Multi-Store Garden Shed actually has two different doors for us to talk about. Let’s start with the door on the main shed right on the front. Unfortunately, Waltons have not given us the dimensions for either door which is a little frustrating. But our eagle eyes can see that the front door is right in line with the eaves so it is going to be around 5 feet 11 inches high. This is a single door, but we do not see you having any trouble getting in and out. 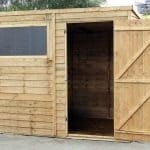 The extra shed has a large set of double doors which take up a large portion of the side of the shed, so in our experience we would say that these double doors will bet at the very least 5 feet wide. One thing that really impressed us was how all of the doors are supported with strong z framing. This will stop them feeling weak and flimsy when you close them. On one side of the shed there is a nice sized anti shatter styrene window. This is a fixed window and it is just the right size to let in a good amount of natural light. We also feel that this window really does add to the overall look of the shed in a very positive way. This is a shed intended for people who have some pretty cool stuff, so it is nice to see that on the side of the shed those double doors are kept secured with a rim lock. Now Waltons say in the description that it is a rim lock, but in the pictures we can see a pad bolt. Either way, we suggest you get a padlock just in case. The single door on the front of the shed is kept shut with a simple turn button catch. 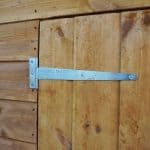 This will keep the door closed, but if you want to lock the shed then you will have to add a padlock and bolt. There is only one window on this shed and it is not overly large so we are very happy with the level of privacy that this shed is offering. You could always add a curtain or just position the shed so the window is facing away from your nosey neighbours if privacy is a concern. 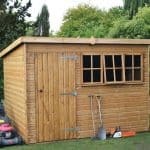 The main way that you can customise this shed is with the wood treatment. They actually offer four different tubs of wood treatment that you can add as an extra. These cost £7.95 each and come in Cedar Red, Golden Brown, Dark Brown and Evergreen. You can also upgrade the roofing felt. For £39.95, you can have some superior duty charcoal coloured felt. 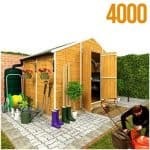 Waltons are offering a number of extras with the Waltons Tongue and Groove Wooden Multi-Store Garden Shed. 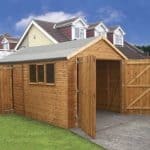 A few of the highlights are their installation service at a cost of £199.99 which is a little pricey and takes the overall cost of the shed dangerously close to £800. One extra that we thought was interesting and worth considering is their Shed Boot Floor Kit. This lifts the shed off the floor a little bit and will help keep the floor free from rot. At £29.99 this is an extra we feel is worth considering. Waltons are also offering a few different security items that you can add as an extra, but to be honest with you we feel a good pad bolt and padlock from your local pound shop is just as good as the brand named stuff that is on offer here. We really, really like this shed and they have done some very impressive things with it, but we have to score it an 8 because of the thin boarding they have used for the roof and floor. With the right amount of care this is a shed that will give you many years of use. So make sure you remember to give it a fresh coat once a year and it will stay looking good for the duration of its life. It may seem high for a 8 x 8 shed, but the extra head room and the fact this is two sheds in one make it a shed that is just perfect for families or people who want to get really specific about the way they store their belongings. Make sure you have a friend you can tolerate for around 8 hours at the most and you guys will have no trouble with this. Basic DIY skills and the ability to actually do what the instructions tell you are all that are needed here. This is going to cause you no more trouble than any other 8 x 8 shed. We have seen lower cost 8 x 8 sheds, but none that offer what this shed offers. Yes the floor and the roof could be better, but we still feel that this is a great buy. 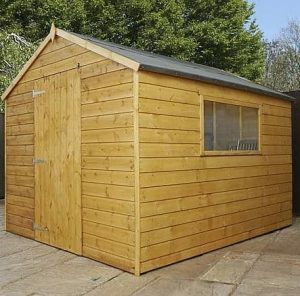 Final Thoughts: As we said in the review, it does take a lot to impress us, but this shed certainly did that. The design is just so interesting and fresh that it is near impossible for us not to love this shed. We know that the floor and the roof are not the strongest, but we feel that if you take one of the flooring extras they are offering, you will not have any trouble with the floor. At just under £600, we feel that this is a fair price for a shed with this much style. 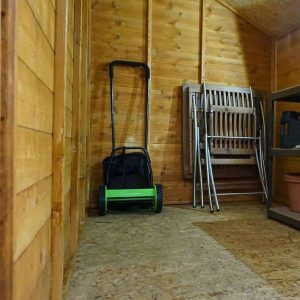 It may be a little pricier than some other 8 x 8 sheds, but we have no trouble recommending this shed. It looks good and offers you plenty of storage space. 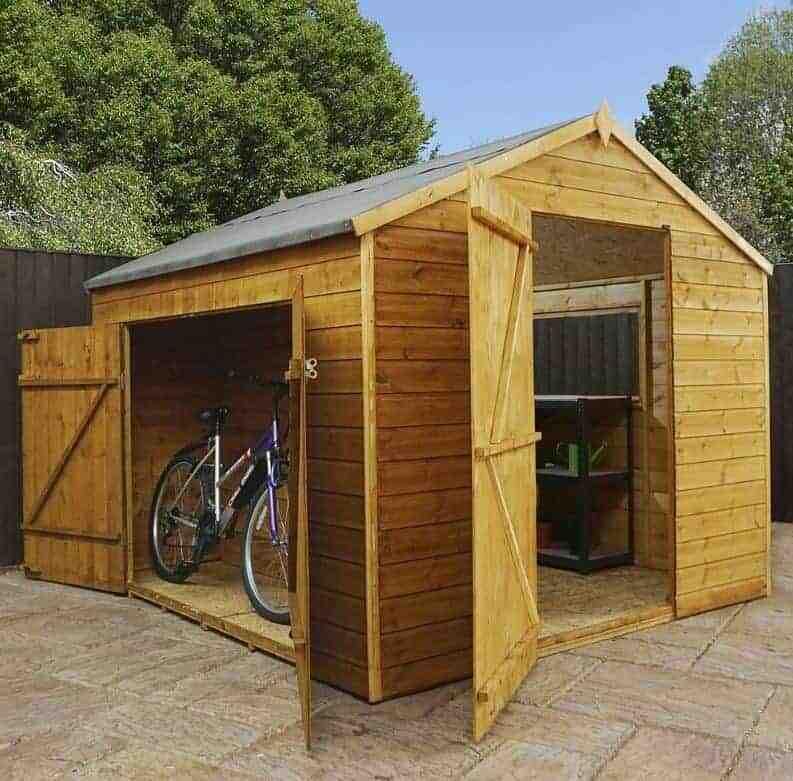 We have a feeling this shed is going to be a big hit, so make sure you are the first in your street to get one.